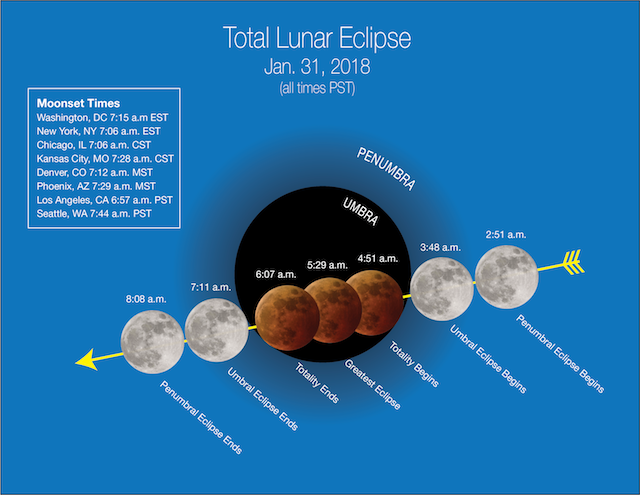 There will be a rare total lunar eclipse tomorrow … well not that the eclipse is rare, but it will be happening at the same time as the blue moon and supermoon, an event that has not happened in over 150 years. The full event will take over 4 hours and the moon will be fully eclipsed by Earth’s shadow for around an hour and 16 minutes. Let’s hope for clear skys! NASA will show views from its Armstrong Flight Research Center at Edwards AFB, the Griffith Observatory in Los Angeles, and the Mt. Lemmon SkyCenter Observatory at the University of Arizona. Coverage will begin at 2:30am PST. At that time, click below to check it out. Griffith Observatory will also have a live stream online.